I have a NEW Kickstarter project! I am excited to launch my new pin design, Bad Parenting. If you grew up in the 90s, you are likely to have owned a virtual pet. Tamagotchis were the best little pet! You had to feed them every 30 seconds, play with them, discipline them, and keep them happy 24/7. If you didn't, well...it would die pretty quickly. You can follow the link HERE to make a pledge for your enamel pin! And spread the word! With your pledge and your support, we can get this pin made! I discovered this cool website a couple months ago. Spoonflower! Have you heard of it? It is an awesome site where artists can sell patterns on fabric, wallpaper and gift wrap. You can buy unique and original fabric there. It's awesome! I just opened a little shop on Spoonflower. I've already have a handful of designs, including Holiday ones! My favorite one is my unicorn gingerbread pattern. =} I really would love to make some cute bows with it or a cute red and blue apron. I've been continuing working on miscellaneous projects that you can see on my Instagram, LizCraftIllustrations! Christmas Cards on the way! I have been painting and designing since the last post I made. Blood sweat and tears have allowed me to make some new material. I am excited to share with you! I have been working on so many projects. There is just so much I want to do! "OOOO!! I want to design enamel pins!!" and "Oh wow! I should make stickers! That's cool!" and then, "I should get into sewing!" That pretty much sums up what goes on in my head every day. And then I'm left with a bunch of projects at once! But I enjoy it because it keeps me busy and not bored of the same old things. So, what I'm trying to say is I've taken a break from illustrating bird and flower cards to illustrate Christmas and Holiday cards. I LOVE how they are turning out and I hope you are too! 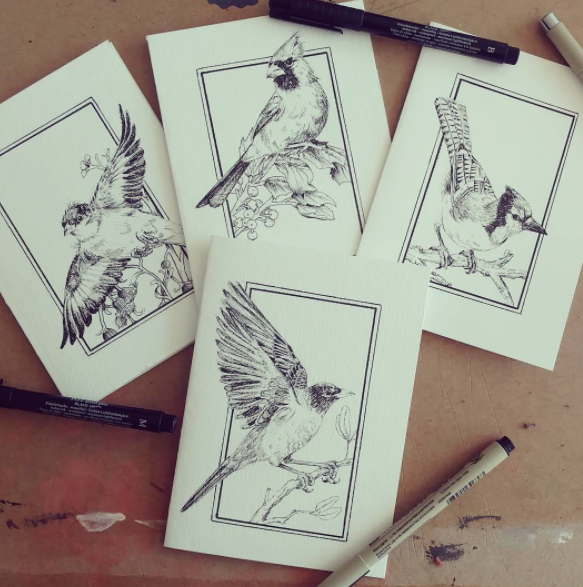 I have a couple of my cards available on my Society6 shop! I am continuing to make amazing Christmas cards that hope you will love. What would you love to see me paint? Comment below! Follow me on Insta!